The U.S. airline industry is a big money-maker for companies, with hundreds or thousands off national and international flights every day. In fact, according to statistics published by the Federal Aviation Administration, there are 43,000 flights in the sky each day. One of the biggest problems for travelers, however, is airline baggage fees. These fees make lots of money for airlines, with baggage fee profits reaching $4.6 billion in 2017. Read on to find out more about how baggage fees work and how you can lower them to save more money on your travels. Click here to find more about how you could lower you travel expenses if you qualify for a tax deduction on your business trips! In the past year, several major airlines have increased their baggage fees. This includes United, JetBlue and Delta. If you want to save money on your baggage fees, then it’s important to know what charges you can expect to see. We’ll cover the fees and restrictions of each major carrier and discuss useful ways to save money on your baggage fees. Keep in mind that there are four general ways to avoid the fees. Buying a premium ticket that includes baggage fees. Using the right credit card. Holding elite membership at an airline. However, you need to know how to apply these factors to each airline and their own policies. American Airlines is one airline that increased their baggage fees. Although the $5 increase isn’t overwhelming, it can still cause issues for travelers. For people traveling within the U.S., Canada, or to the Caribbean, the fees are $30 for the first bag and $40 for each added bag. International travelers are subject to much stricter airline baggage fees, which depend on the ticket you hold and the country you’re traveling to. There are no checked bag fees if you’re paying with AAdvantage Aviator Red World Elite Mastercard and Citi/Advantage MasterCard in Executive, Select and Platinum levels. Travelers can choose from four levels of elite membership and each has free travel or cheaper baggage fees. If you buy a first-class ticket then you can check three bags for free. Active military personnel can check three bags for free when traveling for personal reasons. They allow one car seat and a stroller for each ticket holding individual. Any devices that aid mobility or medical assistance can be checked without charge. Delta Airlines also raised their baggage charges and they’re the same as American Airlines. There’s also a 50lbs weight limit on most bags. However, membership at Delta’s elite program can prove very beneficial for travelers, as can the right credit card. If you’re traveling under special circumstances, you can get free baggage costs. The eligibility requirements are similar with those of American Airlines. Military personnel can check two bags up to 50lbs if they’re traveling for personal reasons. You can also check a stroller or car seat for free as they don’t count towards baggage costs. Delta Credit Cards from American Express enable you to check your first bag for free. If you hold Gold, Platinum or Delta Reserve cards you can get more discounts. If you want to take advantage of cheaper baggage fees, then join Delta Airlines Elite membership program. There are four levels and each lets you check several bags for free. Platinum and Diamond members can check three bags for no cost. Click here to find out more about Delta’s Medallion Club. JetBlue shocked travelers everywhere with their extreme increase in baggage prices. They now charge $150 if you check a third bag, so your travel costs can accumulate. Each bag must weigh 50lbs or less and there are extra charges for overweight bags. Here are some ways you can save money when traveling with JetBlue. If you’re looking for cheap ways to travel with JetBlue, then one of the best is by using one of their approved credit cards. The JetBlue Plus Card and Business Card are issued by Barclays. They enable travelers and three others to check one bag for free. You must have opened the account seven days before travel for the exclusions to apply. Alternatively you can join the elite program and check two free bags. If you purchase a premium ticket, then you can check two bags for free. However, a basic ticket is cheaper and could save you money if you only have one bag. JetBlue also has the same rule allowing military personnel to check bags up to 90lbs for free. Click here to join Ebates and access some great airfare deals and discounts when booking online! If you’re traveling with United Airlines, then you also must pay extra fees when you’re checking bags. This helpful guide shows you much you can expect to pay, but in general it’s $40 for each additional bag. 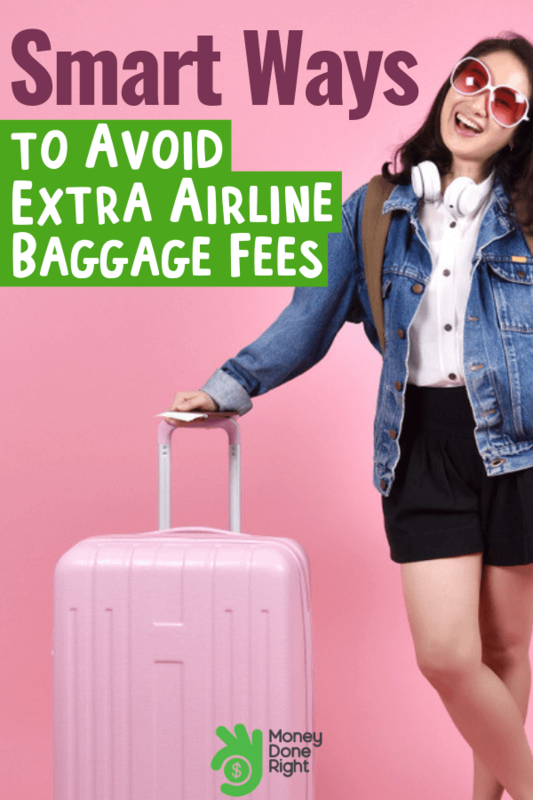 There are also some other ways you can save money with cheaper airline baggage fees. The United Explorer and Mileage Cards have various levels, but each one guarantees at least one free bag check-in. If you upgrade to a United MileagePlus Club Business Card, you and one companion can check two bags for free. The airline also has an elite program where travelers can check their bags for free. The best choices are the Platinum and Premier membership levels. With these levels you can check three bags for three, with each weighing up to 70lbs. Wheelchairs and other devices that are vital for an individuals mobility can be checked for free. The same applies to strollers and child seats. Military personnel can check three bags which weigh up to 70lbs each. If they’re traveling with family members, they can also take advantage of the exception on baggage fees. If you travel for business frequently, check out this article to see if your travel expenses qualify for a tax deduction! The tips above apply for specific airlines, but if you’re not sure who to travel with, then there are some important things to consider. If you don’t use a specific carrier and book the cheapest flight, then you can be hit with some surprise fees along the way. However, these strategies can save you some money and lower your airline baggage fees. The simplest way to get cheaper baggage fees is to pack everything you need in a suitcase. Carry-on suitcases can still cost you money, but in general it’s cheaper than checking multiple bags. You’ll have to make it through security, but sometimes airlines will offer to check carry-on cases for free to save space. Some airlines have their own credit cards, but there are others that can pay for multiple flights. American Express Platinum Cards give travelers annual airline credit. You can get up to $200 to spend on flights and baggage checks. The Premium Rewards Card from Bank of America gives you $100 of airline credit each year and doesn’t have a high annual fee. Sapphire Reserve offers their cardholders up to $300 that can be used for travel related purchases, including checked baggage fees. American Express has a Hilton Honors Card that offers $250 of travel credit each year. The Capital One Venture Rewards Credit Card lets you spend the points you’ve earned on travel fees. Check out this article for more information about the best credit cards to use for lower airline baggage fees. Airlines have a lot of competition, which is beneficial for travelers looking to find the best deals. Some airlines let you check your first bag for free, so always make sure you pick one that won’t charge. You should also check for updates on prices as airlines can increase their fees. This happened recently at American Airlines and other popular providers. It’s worth mentioning at this point that there are other ways to save money. Travel can be expensive, and sometimes the fees are unavoidable. You can accommodate for those fees by using some money-saving techniques. Here are some more tips to reduce your baggage cost. Some companies may seem like they have excellent fees on checked luggage, but you should always check the rules. The allowances depend on where you’re traveling to, which class you’re traveling in and which airline you’re flying with. Read the information provided by your airline carrier to find out how much you’ll expect to spend and see any restrictions that might apply. Before leaving your house you should weigh your bags. That way you can get an idea of whether they’ll meet the weight restrictions. It will enable you to remove items from the bag instead of having to rearrange or remove your luggage at the airport. If your airline offers free checked bags, then you can use this to get cheaper baggage fees for your family. Family members should put items from their bags in another if there’s space. That means you won’t incur any extra charges. When you’re purchasing suitcases or carry-on bags, choose lightweight ones. Remember the suitcase you choose can take up a lot of the weight allowance. Lightweight luggage can cost more, but in the long-term it’s worth the extra money. For more money-saving tips and techniques, don’t forget to check out this article! Traveling can be expensive, but by using the tips above you can lower your airline baggage fees. It’s important to consider all of your options to make the most of free items. If you’re carrying on a child seat, pack it in a bag. You’ll be able to check the bag for free, but lots of people pack some extras below the seat. Upgrading your flight can cost hundreds of dollars, but there are ways to fly first class. Sometimes airlines offer an upgrade on the day of your flight. It means that you’ll be able to check all your bags for free and enjoy a first class flight for a fraction of the price. Thinking ahead will save you time, money and make your flight more enjoyable. Find out how you can save even more money on travel expenses by getting a tax deduction on your business travels! What airlines do you usually fly with and what are their airline baggage fees? Got any extra tips for lower fees?